October 2009. A wonderful scene. At the Santa Fe station in the revitalized Railyard section of town -- cafes, museums, galleries, big Borders bookstore. On the left a Santa Fe Southern consist lined up for a trip over to Lamy and an Amtrak connection. On the right a Rail Runner getting ready for its run down to Albuquerque. Is there a more beautiful testament to good intercity rail planning anywhere in the world? Kudos to New Mexico. We all await the next stage of development. Up to Taos? Denver? 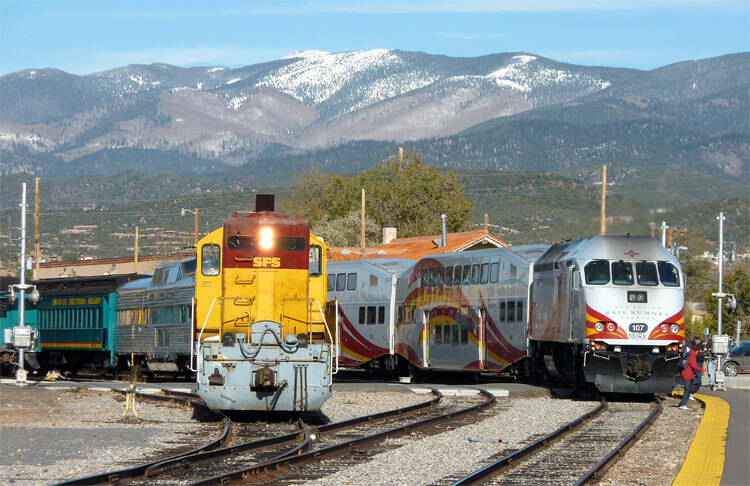 Imagine, Santa Fe a rail transportation hub! 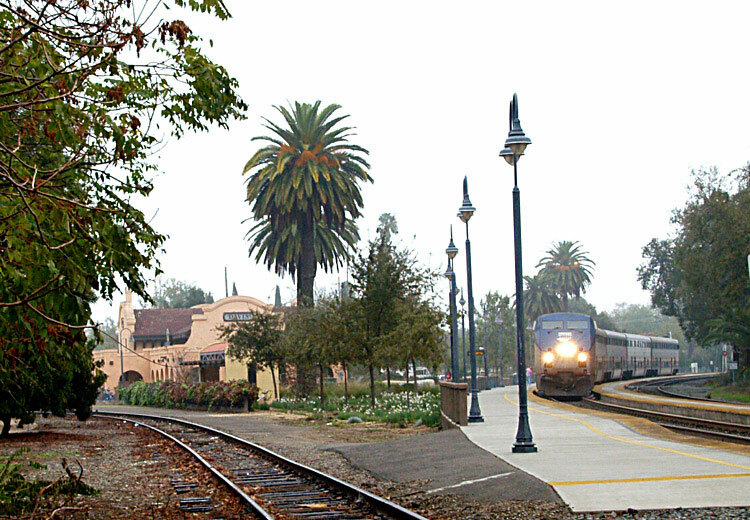 Its a cool and foggy day in November, 2006, and here's a Capitol Corridor train arriving in Davis, California, on its way from Sacramento to San Jose. One of the great and relatively rare (one thinks of the Downeaster in New England and Talgo service in the North West) passenger rail stories in the US, these trains are redefining how people in Northern California travel. There's good food on board, clean windows and a friendly staff. Hopefully, all will survive the current recession and one day feed a new high speed line between Northern and Southern California. Oh, and continue to help wean us out of gas guzzling cars. Camera: Olympus E-300 dslr with Sigma 55-200 zoom telephoto lens. Mystic, Connecticut. July 1, 2010. 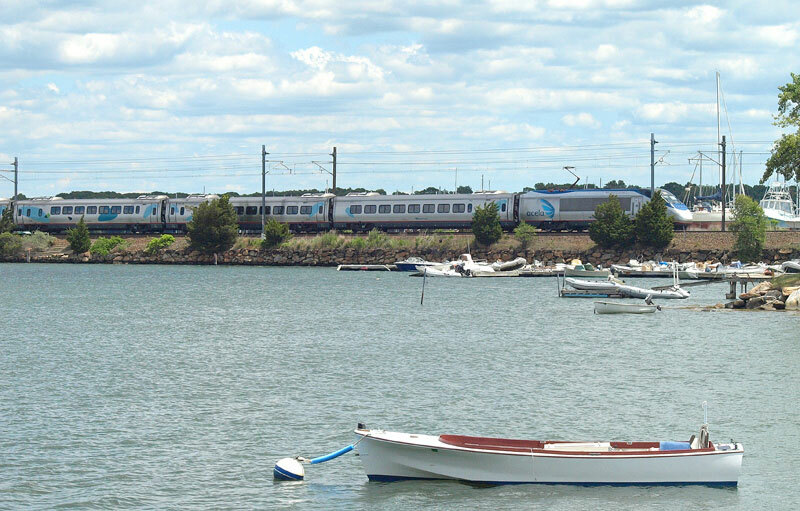 FOA editor Craig O'Connell and yours truly were sitting on a park bench several hundred yards from the tracks when this Acela from Boston to New York and points south cruised by. Elegance in motion. Perhaps slower in motion than its designers had hoped, but still a beautiful sight on a gorgeous day. Amtrak is busily repairing bridges and infrastructure on this part of the Northeast Corridor so as our nation's birthday approached there was reason to be hopeful for the future. Oh, and the seaside lunch we had a few minutes later in Noank capped our day perfectly. Camera: Olympus E-510 dslr with Olympus 70-300 zoom lens. Saturday, August 21, 2010. A perfect California day. About 3:45 pm I parked myself on the pedestrian overpass in Emeryville and got ready for the parade of Amtrak trains due in the course of an hour: A San Joaquin, two Capital Corridors and the California Zephyr. Fortunately, the Zephyr was a bit late and at 4:40 my photographic luck went over the top. Along came a BNSF officer train on its way from Chicago, now on UP tracks (thanks to rail guru Mike Tisdale for info on it; I didn't have a clue as to what I was seeing when I grabbed the shot). A real beauty, with a full length dome turned into a theater car bringing up the rear. There isn't much more to be said save "take me back..." to the pre-Amtrak Santa Fe trains I rode in my youth. For photographers reading this, the Emeryville perch is one of the best places in the country to grab rail action. Free parking at the bottom of the stairs (or elevator) across the tracks from the station, a good long view up the tracks to Berkeley, and lots of action almost any time of the day. And thanks, Mike. Camera: Panasonic Lumix ZS1 with Leica zoom. Changes last made on: August 29, 2010.